So I’ve been sitting here for the last 27 minutes staring blankly at this screen, the smell of freshly ground coffee fills the airwaves as it cools to the perfect temperature. My mind wonders as it gets lost within its own preconceived thoughts of Morocco. Having never been to this part of the world, all I have is the thoughts imprinted on my brain thanks to movies, pictures, written words… and of course the episode of “Jamie Does” when he goes to Marrakesh. I picture Morocco as a not so forgotten time capsule filled with a sea of culture beaming with good music, great food and beautifully designed buildings, yet untouched by the modern world. I picture vast open deserts, red dirt and heat waves rippling in the distance. As you walk down the street I imagine donkeys, street markets and hessian bags filled with spices with people everywhere. 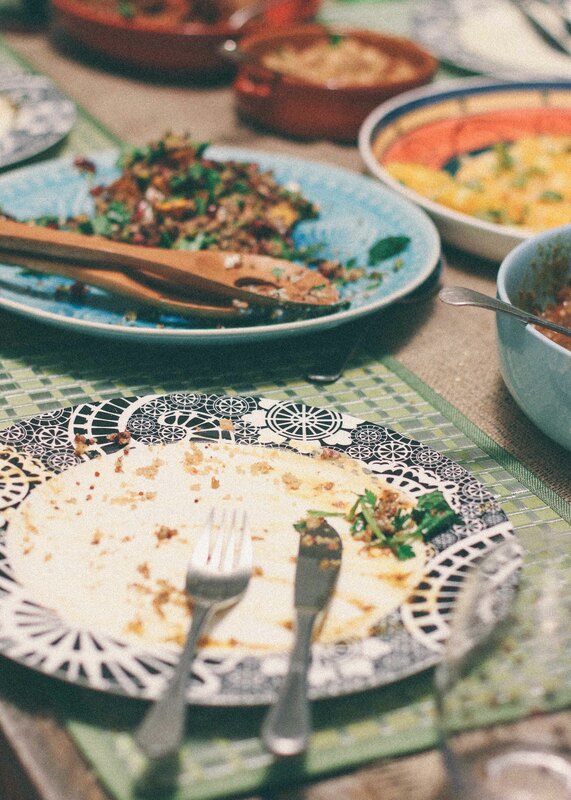 I see the Moroccan way of life heavily based around food and feasting with family and friends. I could be wrong, but for the moment this is how I picture Morocco. Last year I attended the Eat Drink Blog conference, after the conference I walked out with a wealth of new knowledge and formed friendships with fellow food lovers. We decided late last year that we must plan a catch up, and what better way to do it than with a themed dinner party? Jemima of Feed Your Soul Perth, kindly offered the use of her kitchen and home for the evening. We decided to keep this one small to see how it went. On the guest list we had, Jemima, Lexi (Jemima’s sister), Laura from Laura’s Mess and her husband Aaron (the creative mind behind my cool new Inspired Food Dude) and of course I was there. Themes were discussed and the winner was a Moroccan inspired feast. As we were welcomed into Jemma’s home we spotted a beautifully laid table outside which fitted in perfect with the Moroccan theme. Once everyone arrived we jumped straight in. Laura kindly offered to make some dips and dessert for the evening… well actually I think Jemima and I snapped up the option to cook the mains before Laura had a chance. This didn’t seem to bother Laura at all, when she arrived I spotted what looked to be amazingly fresh flat bread rolled up in a towel, I could tell this was going to be the start of something wonderful. I wasn’t disappointed, the towel was slowly removed and a beautiful homemade Khobz (Moroccan Flat bread) was revealed… yum. Of course you can’t just eat the bread on it’s own (well some people can), so it was served with a split pea bessara dip and burnt eggplant, tahini and pomegranate dip. This combination of flavours transported me right into my mind’s eye of Morocco. As Laura plated these up, you could just tell by watching her and the way she moved that her eye for detail is amazing. The bread was positioned on the board to look just right, a slight adjustment here and there and we were left with a dish that looked like it belonged in a cookbook. After tasting both dips I could instantly tell that Laura’s attention to detail translates into her cooking as well. The balance of flavour was perfect. After sufficiently stuffing our faces with breads and dips, it was time for Jemima and I to step up and cook/serve our mains. Jemima opted for a Moroccan spiced quinoa salad and a chicken and date tagine. The Moroccan spiced quinoa salad was outstanding and is definitely a salad I’ll be adding to my arsenal. The combination of pumpkin, pomegranate, olives and goats cheese (as well as an array of other ingredients) is enough to win anyone over. Then came time for the Chicken and date tagine. With my first spoonful of this dish I was instantly transported back to my childhood and the combination of date and chicken triggered my memory of apricot chicken as a child. I think when fruit is added to a savoury main, there’s a certain sweetness it brings, and it’s a winner in my book. 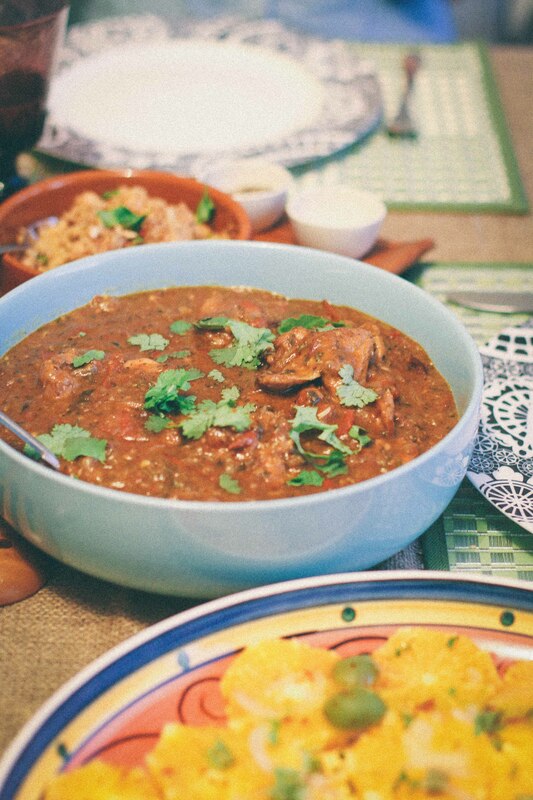 The chicken tagine was laced with Moroccan spices and once again everything was perfectly balanced. The smell of cinnamon when this was getting cooked was again a reminder of my vision of Morocco. Both these ladies sure know how to cook and have outstanding palates. Once we had finished our mains, we took a long break to make room for everybody’s favourite course… dessert. Laura was on dessert duties and made a spectacular za’atar pistachio and rose ice- cream, cardamom and orange blossom ice-cream with an almond pistachio shortbread. I think this was the dish of the night for just about everyone sitting at the table. The ice-cream was deliciously creamy with the shortbread adding great texture. The flavours are present but not too in your face, again everything balanced perfectly. After a nice cup of tea, that was it, the night was over. We all ate far too much and enjoyed every mouthful. 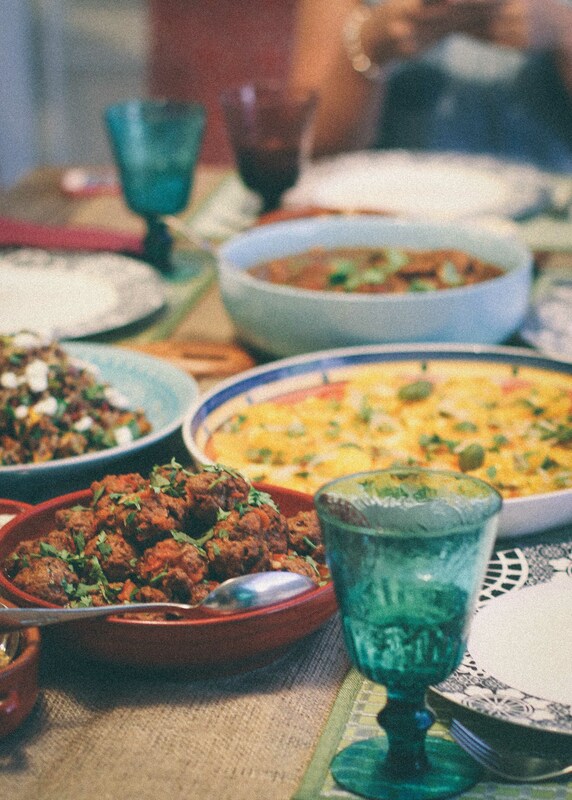 I highly recommend you do yourself a favour and take note of all our recipes from the night and organise your own Moroccan dinner party. You can find them here, on Inspired food, Feed Your Soul Perth and Laura’s Mess.. You won’t be disappointed, I promise. 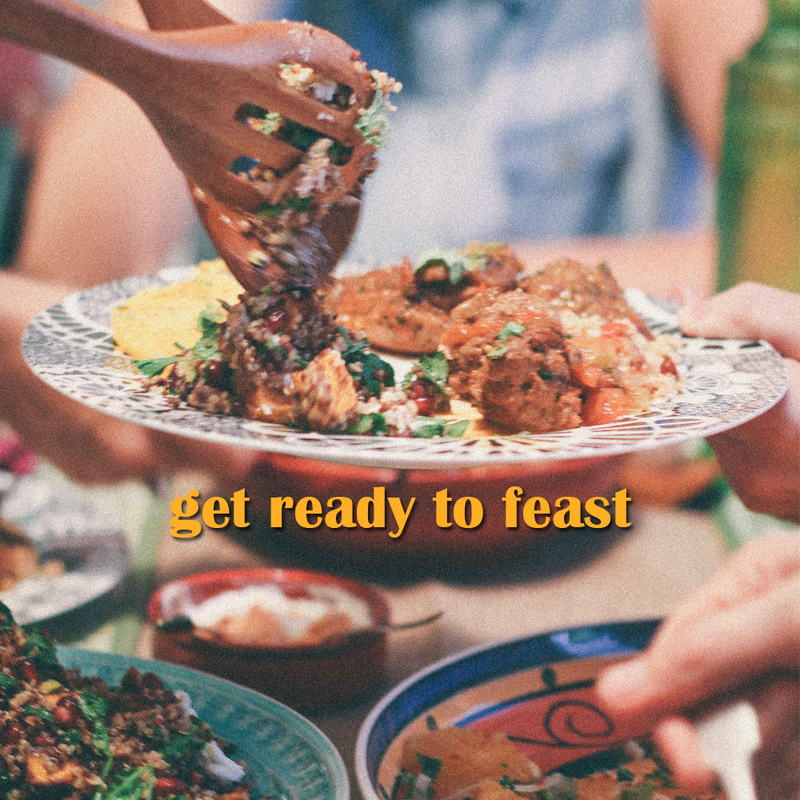 I can’t wait for our next feast… although I’ll need to bring my A game in order to keep up with Laura and Jemima! 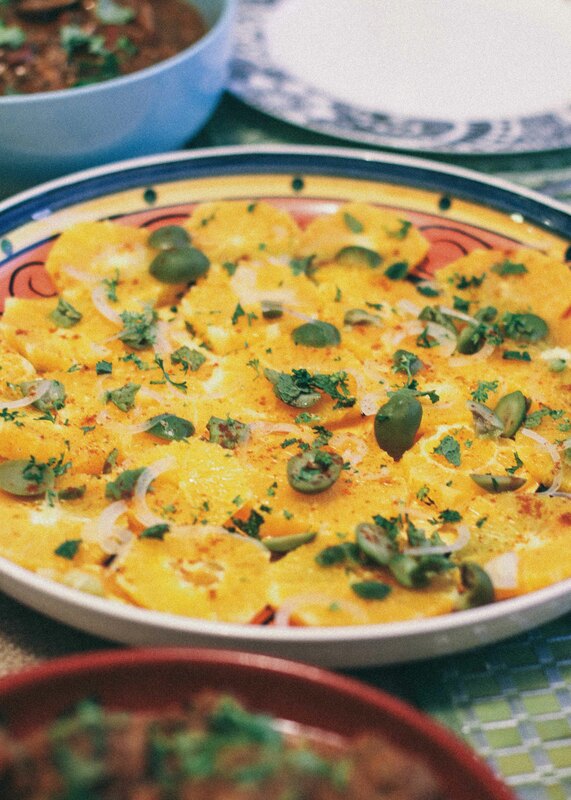 Lay the oranges out on the platter, scatter the onions olives and pomegranate over the top. Combine 1 tablespoon of the left over orange juice with the lemon juice and pour over the salad. Add the parsley and mint to the salad. Combine the spices in a bowl and sprinkle over the top of the salad (don’t be too heavy handed with this part). Combine all the ingredients for the meatballs into a large bowl. Once combined shape into little golf sized balls. Once all the meatballs are browned remove them from the saucepan reserving the oil. Use the oil to cook the onions, garlic and capsicum over a medium low heat until the onions soften. LOVE IT MATT!!! Great photos as always! Can't wait for the next one!! Thanks Jemima :) I'm also looking forward to it! Might be a good excuse to get another cookbook? The dinner sounds amazing! Such a rich tapestry of dishes, I'm quite impressed at the selection. Beautiful photos really helped me travel through the experience. I think I'm going to have to have. Moroccan dinner party. You've Inspired me! Love this Matt! Amazing photos and such a generous, detailed write up of every course... you write so well, I felt like I relived the night all over again :) You guys are immensely talented and definitely healthy competition for me to keep working on my A-game too! Can't wait for the next event! Thanks Laura! My writing is nowhere near as good as yours :) I'm really excited for the next cook up! Stunning photos and awesome post, love it! Like I said to Laura, wish I was there. Looks like a cracking night! Matt, I just read Laura's post about the meal. I love everything about it, what a wonderful time you all had and the food is spectacular, all of it! 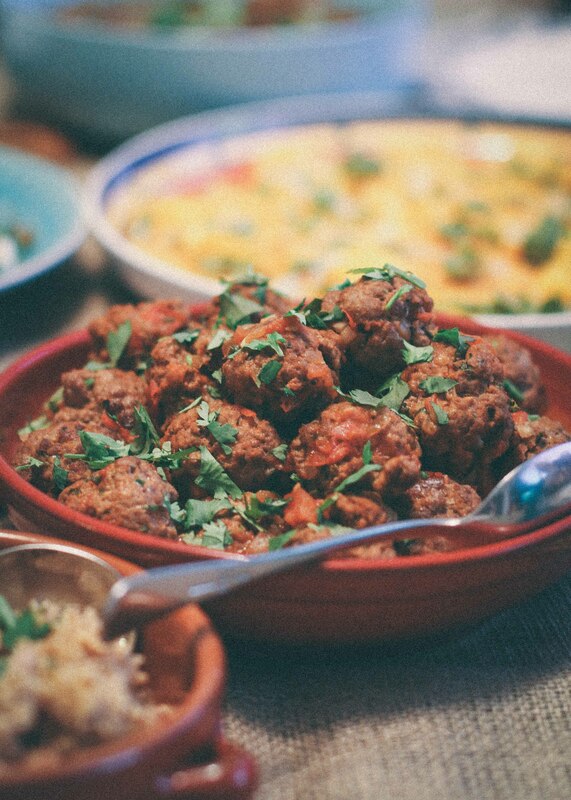 Going to try that lamb meatball stew, it sounds heavenly! Beautiful photos! And those meatballs are amazing. I might try that with chicken when I find myself craving for meatballs cooked the Moroccan way. Thank you :) I've enjoyed looking through your blog! Can't wait to see what is next. Lovely photos and now I'm feeling quite hungry! Mission accomplished and thank you :) I'm loving the look of your crispy hash browns! WANT those meatballs! Sounds like a great feast and wonderful company. Thank you :) I recommend regular feasting with wonderful company and plenty of meatballs! What a feast! A very colourful one too :) I didn't know much about Moroccan food but after reading all your posts I'm learning about different dish combinations and flavours. This dinner has served an educational purpose for me! I wish I could have been invited to this lovely spread! Beautiful! This looks so fantastic, your dishes sound delicious, and that table setting is amazing! man, you have the best parties! and the theme: how completely inspiring. i love that you all embraced this culture and cuisine, though you've never been. i'm hosting my first ever dinner party this weekend and it was in part to your previous post. imma have guests sitting on the floor and hopefully it'll be a ball! Your photography is just AMAZING! I was drooling over that delicious food! Wonderful site. A lot of helpful info here. I am sending it to some friends ans also sharing in delicious. And naturally, thank you to your effort!